Thanks to the fabulous Envision 8th public engagement process of 2017, a new and improved Eighth Street is coming in 2019. The final design is currently in the works and will again be discussed at the City Commission meeting tonight. We’re super excited for this revisioned Eighth Street. A beautiful, welcoming and inviting street where we can conveniently and safely access neighborhoods, businesses, workplaces, parks, food markets, Boardman lake, the library, and public transit by foot, bike, or car. Alongside our members and partners, we are committed to helping make this happen. 1. A walkable street. Wide, inviting sidewalks flanked by beautiful canopy trees. Raised and highly visible crosswalks at all intersections and mid-block crossings. 2. A bikeable street. Highlighted by a world-class cycle track that encourages bicycling for daily transportation all year round. 3. A safe street. A street design that discourages speeding and reduces the likelihood of serious injury for all road users. A street that provides dedicated space for all users of the street. Narrow vehicle travel lanes. Proper lighting for drivers, bicyclists, and pedestrians. Here’s a quick sketch we did that shows a bit wider sidewalk and cycle track and a small buffer between the two. While we are committed to building a stronger, better connected and more walk/bike friendly Eighth Street, we are only one piece of the puzzle. Email City leadership and share WHY a walkable, bikeable, safe Eighth Street is important to you. The Solution in School is part of Norte’s broader community-wide bike mechanics education initiative dedicated to empowering people of all ages and abilities to learn the skills that help promote self-assurance, confidence, creativity and lifelong bike independence. We believe that understanding basic bicycle maintenance and repair is a lifelong skill that gives the young and young at heart the knowledge and confidence to ride more, venture further and embrace a happy, healthy lifestyle. This pilot program teaches 6th-8th graders basic bike repair skills in an engaging, hands-on manner. It will also do good in the community as students will be working on Norte’s Bike Library bicycles, which will be loaned out to local kids in need. The Solution in School is going to launch this spring. If you have any of these tools collecting dust in your garage, please consider donating them. We promise to put them to very good use. Gently used 20″ and 24″ youth mountain bikes with handbrakes and gears. No big box store bikes, please and thank you. Sticking around Traverse City this spring break? Hop in one of our 10 fun bike mechanics classes at the Wheelhouse to turn some wrenches and get your learn on. Knowing how to maintain and fix your bicycle is the BEST! Understanding basic bicycle maintenance and repair is a lifelong skill that gives you the knowledge, confidence, and independence to venture further and have more fun. The Solution is Norte’s new educational series that is designed to progress participants from zero knowledge to advanced skills. Ideally, classes will be done in order but if you already have the skills to say, skip the 101 /102 classes and go right to 201/202, you’re welcome to do that but instructors will assume participants know all beginner skills when teaching the intermediate/advanced skill classes. Bring a bike, or let us know ahead of time if you need to borrow one. Class size is limited to five (5) participants. The Wheelhouse is our awesome new old building on the north side of the Civic Center Park. The nearest parking lot is at the Civic Center. From there, you’ll have to walk or roll. A sweet Norte tube patching kit! Why not recycle your tube?! Or register in person at the Clubhouse. Lots more classes in April including some for adults and lower elementary students. Details HERE. Need more details? Email ben@elgruponorte.org, call 231-883-2404 or stop by the Clubhouse 9-5 PM weekdays. The Solution is a new community-wide bike mechanics education initiative dedicated to empowering people of all ages and abilities to learn the skills that help promote self-assurance, confidence, creativity and lifelong bike independence. We believe that understanding basic bicycle maintenance and repair is a lifelong skill that gives the young and young at heart the knowledge and confidence to ride more, venture further and embrace a happy, healthy lifestyle. A series of structured educational classes for people of all ages and skill levels. Learn more and sign up for a class HERE. A pilot program at West Middle School that teaches 6-8th graders basic bike repair skills in an engaging, hands-on manner. It will also do good in the community as West Middle students will be working on Norte’s Bike Library bicycles which will be loaned out to local kids in need. Details of the Titans Solution HERE. El Barrio Bike Fix is a free, weekly summertime community meet-up in La Plaza, the lush green space next to the Clubhouse, where we get our hands dirty, turn wrenches and learn basic bike repair and maintenance skills from our professional bike mechanics and volunteers. Pop-up Ding, Wave and Wrench events around town like this we did in 2015. Celebrate riding bikes all year long and help Traverse City become the Winter Biking Champion Of The World as we compete against northern cities in Canada, Europe, and the US. Our sixth annual Traverse City Winter Bike To Work Day and School Day is in 2 weeks on Friday, February 8th and it’s sure to be awesome. Promise. Step 4: Celebrate! Join us for happy hour at The Filling Station Microbrewery from 5-8pm. Now get out and practice! The best way to become a better winter biker is to ride your winter bike more, of course. Just remember to dress warm, take it a bit slower, make those turns wide, and smile! Stay up to date by joining our WBTW+SD Facebook event. City Commissioners will hear a proposal from MDOT to install High-intensity Activated Crosswalk (HAWK) signals at crosswalks on Grandview Parkway – specifically at Elmwood and Hall streets. These crossings (plus Oak Street), serve as key connections between our TC neighborhoods and the bayfront. We think HAWK beacons are a good option to improve the comfort and safety for people crossing Grandview at all non-signalized crosswalks while MDOT works toward a safer street design with planned reconstruction in the coming years. After a successful first year, we’re excited to expand the Advocate Academy county-wide in 2019. The Grand Traverse Advocate Academy is a community-driven program that empowers ordinary people to be effective leaders for policies and infrastructure that encourage walking, biking, transit use, and other forms active transportation. The Grand Traverse Advocate Academy is an engaging, hands-on, classroom setting facilitated by experienced advocates. Sessions require active participation by participants as we explore the topics of effective community advocacy. A combination of reading, individual and team projects as well as guest speakers to connect “classroom” learning to real, current efforts occurring throughout our community. You bet. Thank you, League of Michigan Bicyclists and Groundwork Center. While flipping through Jeff Speck’s fantastic new book “Walkable City Rules“, and although the entire book is valuable, rules #48 and #49 are especially well timed for Traverse City’s new 8th Street design. Narrow lanes can still move plenty of cars and there is no reason for anyone to be driving faster than 25 mph in our city. 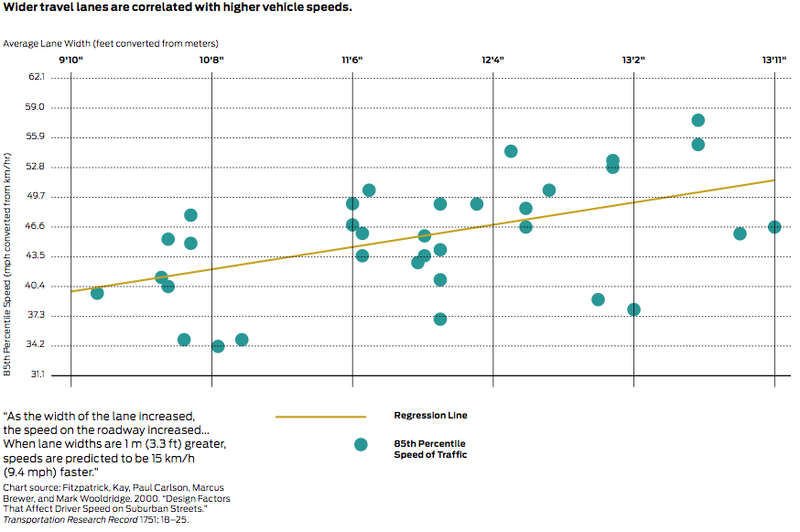 Let’s design 8th Street for 25 mph so people drive 25 mph. We’re dreaming of a truly great 8th Street that is welcoming for all people no matter how they’re getting around. While we are committed to making this happen, we are only one piece of the puzzle. We need YOUR voice. We need YOU to advocate for safe, convenient and accessible opportunities on Eighth Street. 1) Write a letter to the editor to help educate your neighbors about why a healthy Eighth Street is so vitally important to the immediate and future health of our City. 2) Email City leadership and share WHY a walkable, bikeable, safe Eighth Street is important to you. Kick the year off by fixing something with your smart brain and your strong hands! Knowing how to maintain and fix your bicycle is the BEST! Understanding basic bicycle maintenance and repair is a lifelong skill that gives you the knowledge and confidence to keep your ride rolling. The Solution is for all awesome middle and high school’ers. No bike repair skills necessary – this is bike fix 101. Participants are welcome to bring in their bike or use one of ours to learn on. Just let us know! 2018 was an incredible year for a healthier, better connected, and more walk/bike (and transit – Go, BATA!) friendly Traverse City. Big thanks to our partners at the City of TC, Grand Traverse County, BATA, DDA, TC Parking Services, DTCA, and TART Trails. Lake Ave bike racks provided by TC Parking Services. Enhancing the walking experience, the DTCA installed a public art piece of wings on the 300 block of E. Front Street and the DDA facilitated through a donation from John Socks hearts on the public restrooms on Park St., a tribute to the heart wall the was once on the 200 block of E. Front St.
Did we forget something? Let us know! Have 45 seconds to help Norte measure its health impact? Did your child participate in a Norte program this year? If so, please take 45 seconds to complete this short but sweet and very important survey. The data allows us to make better-informed decisions to ensure that our programs are effective and impactful. Great! On average, how many more minutes/week of physical activity? Learn more about Norte’s youth programs HERE. It was a big day for the Amigos program yesterday. We met our $1,000 Giving Tuesday goal by 10am and then crushed our $2,000 stretch goal later at The Little Fleet dance party. Thanks to 36 awesome people, we raised $2,250 in all. $2,000 of this will be matched dollar for dollar by Teter Orthotics & Prosthetics, 4Front Credit Union and the Down Syndrome Association of Northwest Michigan for a total of $4,250. Amazing. This year’s Giving Tuesday awesomeness will allow Norte to continue to build a happier, healthier, stronger communities by empowering young people – and those who love them – to be active for life. The Amigos program which teaches confidence, independence, and bike/pedestrian safety skills to young people with special needs through empowerment, education, and adventure is going to rock in 2019. Thank you for supporting Norte’s vision of inclusion and the idea that all young people – no matter their ability – should have the opportunity to experience the joy of independent mobility that comes with riding a bicycle. And don’t forget! My Secret Stash is selling this beautiful hand oxidized art piece by A State of Copper with 100% of sales going to the Amigos. BIG NEWS! Just last week, the U.S. Department of Health and Human Services released a new and improved 2nd Edition of Physical Activity Guidelines for Americans. This document, authored by some of the brightest researchers in the country, highlights just how much we should be moving as a society and why. But first, what exactly is physical activity? Well, the World Health Organization defines Physical Activity as “any bodily movement produced by skeletal muscles that require energy expenditure.” Hold up…does that mean something as simple as walking to school or riding your bike to the park counts as physical activity? You betcha! Okay, so we all know being physically active is important, right? But why is it important? Well, according to the report, in kids as young as six physical activity is associated with improved cognition, decreased depression, and improved health of the heart and lungs. In adults, the benefits are even more pronounced. Decreased risk of cancer, dementia, heart disease, improved sleep, and reduced anxiety are just a few of the many benefits of being physically active. Sound good? Yeah, we think so too. So just how much of this physical activity do we need to reap all of these amazing rewards? Well, the good news is that every little bit counts. As little as 10 minutes of activity can lead to immediate, short-term effects like lower blood pressure and reduced anxiety. But why stop at just ten minutes? At Norte, we believe in happy, healthy, strong kids and grown-ups here in Northern Michigan. We realize that we can’t be our best – our healthiest – without daily physical activity. That’s why we’re working hard to make sure more opportunities for physical activity are engineered into daily life. Not all of us have the time or the desire to work out at the gym or don the spandex for a day-long cycle tour. But we all have to get from Point A to Point B. Whether that’s from home to work, to school, or the store – these can all be opportunities to be physically active. But we need safe, well-connected infrastructure to make moving (not driving) an easy choice. We need land use decisions that allow people to live near the services that they need to access on a daily basis. And we need awesome people like you to live out our mission of a happy, healthy, strong Northern Michigan. Interested in joining us for the 100 Families + The Traverse City Light Parade but not quite sure what to expect? Here’s everything you need to know. Where: Staging is on the 200 block of South Franklin at 6:45 pm – look for our flags. We’re #23 which is near the end. What to wear: Orange of course. Dress warmly and have your walking shoes/boots on. The more orange the better. What to bring: Lights, lots of lights…flashlights, battery-powered Christmas lights, glow sticks, if it lights up, bring it and wear it or carry it. Do I bring my bike? You can bring your bikes. However, per past experience, we have found that the parade can get a little slow at times and you end up walking with your bike. Bike or walk, doesn’t matter. Do what makes you happy! What are we doing in the parade? Well, we will be blasting the tunes and getting you pumped up to walk, skip, dance and dish up high-fives to everyone you see along the route. Line up will be as follows: 2 flag bearers up front, walkers behind them, next will be the orange trailer with music and then bikes will bring up the rear. Can I invite friends to be a part of our group? Yes! Just share this page with them and they can sign up below. Easy peasy. We are so excited!!! Be sure to tell all your friends! Last week to get you some delicious Coast coffee from our friends at Higher Grounds. Coast is a smooth medium roast with a milk chocolate, brown sugar, and white peach profile that benefits our adventure-based empowerment program, The Bike Más Project. Use code NORTE10 to score 10% off your purchase of Coast coffee. The Bike Más Project is all about teaching upper elementary students “bike smarts”, confidence and independence through pedal powered adventures. What started in 2014 at Traverse Heights Elementary as a Safe Routes To School funded program, The Bike Más Project expanded to 17 area schools this fall. The Bike Más Project aims to empower more – lots more! – young people to healthy, happy, and active for life through bike safety, education, and adventure. Funds generated by Coast sales will help this dream happen. Coast can be purchased online HERE. Another school year starts in less than a month. Unfortunately, it’ll be another school year – the 12th school year to be exact- of the 3 Mile trail going nowhere. Despite lots of momentum last year with the East Bay Parks, Planning Commission and Board of Trustees each passing a resolution of support to move ahead with a Safe Routes To School grant application, four walking audits completed at Grand Traverse Academy, Grand Traverse Area Catholic Schools’ SEAS, EMS and Cherry Knoll Elementary , a community-wide action planning meeting, the design study to assess trail costs and possible location (a study that TART Trails fundraised $10,000 and East Bay budgeted $40,00 for) will not happen in 2018. Instead, we’ll wait. Wait for what? The results of the Grand Traverse County Road Commission’s East-West Corridor Transportation study, that’s what. While 3 Mile obviously goes north-south, it’s width, design, and right of way may be affected by this study that won’t be finished until 2019. With four schools, a library, a BATA bus stop, a grocery store, and many other businesses, the 3 Mile/Hammond intersection deserves better. and tell them that extending the 3 Mile trail to Hammond and beyond matters to you. We’ve all experienced that moment when we pull up to a light alongside another person driving their car and we do everything in our power to avoid eye contact. Summer is perfect for this as we normally have sunglasses on and people can’t really see where we’re looking. “Oh they’re just looking off into the distance,” we think but really they’re looking right at us while we look right at them. Humans subconsciously love closed spaces, it’s why our beautiful downtown feels so nice when you’re walking through, those buildings being right on the street to make you feel comfortable and confident. The trees separate us from the street. We all walk like we’re ten feet tall. Vehicles tend to create this feeling as well. Those tight spaces with four wheels make us feel comfortable and confident. It’s probably why we avoid eye contact, we subconsciously refuse to believe that anyone outside our space is there next to us. It’s safer. The problem with comfort in a vehicle is just that, we are comfortable in a vehicle. A 3,200+ pound moving sedan is not our bedroom with the door closed. It’s not walking downtown. It’s not coffee at your favorite coffee shop with a good friend. It’s a large moving vehicle. The other day I was driving my boss’s truck (oh my gosh! Shea!) and I tried to note the feelings I had. I definitely felt extra safe in the air-conditioned, cushy seated, closed cab. And I started to let my guard down a bit and I definitely found myself speeding up ever so slightly. It’s funny how those silent cabs can allow your foot to push the gas pedal closer to the floor. Everyone remembers their first car and if you were anything like me it was… a junker. I remember going over 35mph and the steering wheel would rattle a bit and the car as a whole would make all kinds of odd noises. The trunk refused to open and the tires barely held air. The air conditioning was just more heat on those hot summer days. But those frigid winter days? Oh, baby, you got even more cold air pumped into the cab. Needless to say, because of all these odd quirks I was never comfortable in that car and because I wasn’t comfortable I felt I was more alert than I am in cars today. Biking for me is such a great way to engage with my surroundings. I come to a stop light and instead of ignoring that person next to me on their bike, I say hello or just a simple nod to acknowledge their existence. I wave or ring my bell (ding, ding) to people riding by on the TART trail. I feel so much more aware of traffic because I’m basically forced to be aware. I’m out there in it. If my experience in the modern car is not unique to me, then other drivers are also getting rather comfortable in the cab. They are losing that awareness that there is a world outside. This is what forces me to pay more attention to what is happening around me, knowing that there is probably at least one driver who is a bit too comfortable. Thinking this way about the experience of driving a vehicle versus biking has humanized the drivers. I feel as though they may not be maliciously crowding me while I ride downtown, they may just be victims of their immediate surroundings. This does not give them the right to crowd bicyclists but it does make me think twice about becoming overly angry. They are not simply chunks of metal welded together to create this giant vehicle, they are human. Also, I think simply acknowledging that I become a bit too comfortable while driving a car has caused me to remain aware. To not give in to that air-conditioned, cushy seated, closed cab. To say to me, there is a world outside of these four walls and that world is full of people. So, this is a call to action for anyone using our roads during these busy summer months, to remain aware that you are surrounded by people and that they are all probably very nice. Don’t become too comfortable and don’t become too angry. We are all victims of our brains and that’s a subject too complicated for a single blog post. We are all human. Let’s ride fast, let’s ride hard, let’s ride but remain aware! Shea O’Brien is a Traverse City native, Civic Center neighborhood resident, Traverse Heights Elementary alum, Clubhouse member, Marketing Specialist at Superior Physical Therapy, lifter of weights, Traverse City Advocate Academy participant, and proud book worm. Follow his adventures at @shea.m.obrien. Once again, the issue of sidewalk gap and infill will be before City Commissioners at their meeting Monday, July 16th. Commissioners have already voiced support to invest $4 million dollars to repair all of the City’s poor/very poor sidewalks and to add new sidewalks to key areas where they are non-existent – primarily in the Traverse Heights neighborhood. Initial work on this project has already begun, with sidewalk repair occurring in many neighborhoods this summer. The next step in the process occurs Monday night. A “resolution of intent” must be adopted, which authorizes the City Clerk to alert Traverse City voters of the City’s intent to issue $4.9 million in capital improvement bonds to cover the costs associated with this large scale investment in sidewalks. Passing this resolution is the next step in ensuring that the Traverse Heights and East Front neighborhoods will receive the new sidewalk infrastructure that they desperately need.